I got home last night excited to log into EVE. I received a minor disappointment when I didn't see the Shadow of the Serpent content on the character selection screen. Hey, bugs happen. I'd also heard something about a docking animation and wanted to try it out. I thought the docking animation occurred outside the ship, which caused me a little concern. The truth was, in a strange way, worse. The first thing I saw when I logged into the game was my Cheetah slowly flying past as my disembodied body started drifting in the other direction. That messed with my head. I have a little problem with motion sickness in games. For example, I can't play Elder Scrolls Online for long periods of time due to the camera setup. In most games when I play in third person mode, the camera is positioned in such a was that the camera angle is looking in the same direction that my avatar is travelling. Not so in ESO. The angle is off just enough that I start feeling queasy if I don't take frequent breaks. I started feeling the same way watching my ship fly in the station. I didn't know why, though, so I undocked and played with the little blue pointer that now protrudes from the front of ships. I can see the use for making instawarp undocking bookmarks, so I flew out 150 km from the station, then returned to the station and docked. Upon docking, the flying in station animation appeared and I started feeling a little strange again as I watched my ship fly by. I figured out that I needed to stop my ship to make the feeling go away, but I couldn't. Aargh! I felt really frustrated because for almost seven years, I always had control of my ship. Even in those instances where a player tackled and destroyed my ship, I still had a feeling of control, even if all I could do was align to a planet so I could warp my pod to safety. I really, really wanted to stop my ship, but the game had taken the control away from me and all I could do is look away from my screen in order to make the feeling go away. I'll admit I said a couple of bad words and then logged out of the game. I figured maybe if I ate dinner I would feel better. I usually try to eat something before playing ESO as that seems to help. The solution to my problem hit me while preparing a salad. My client was set to view the ship hanger when I docked. What would happen if I switched to the Captain's Quarters? Op success! Instead of seeing the flying ship, I received a loading screen and then appeared in my Captain's Quarters. Now, some may think that flying in stations is just a cynical ploy by CCP to trick players into using the Captain's Quarters instead of the ship hangar. If so, they succeeded in getting this player to make the switch. Anything to keep from seeing that stupid animation again. On Friday I received an email from a public relations person at Kinguin, a competitor of G2A. I guess my piece on Wednesday documenting yet again why G2A is shady put me on Kinguin's radar screen. The representative wanted me to pimp their new program aimed at convincing indie game developers to sell their games on Kinguin. With all the news about how G2A rips off developers, now's the perfect time for Kinguin to entice indie developers, right? In case anyone forgets, Kinguin is a very shady place as well. Back when hackers purchased thousands of FarCry 4 keys using stolen credit cards, over 4600 of those game keys were sold on Kinguin. One test I use to figure out a company's ethics is to look up the offers for popular games, or at least games I'm familiar with. I usually start with EVE Online PLEX. Needless to say, Kinguin failed the test. Instead of just stating that Kinguin is engaged in illicit RMT, let me walk you through why I believe that Kinguin is engaged in the practice. In the graphic above, let me point out three indicators that the offer is totally shady. First, the price is way too low. While not as cheap as those found on various forums and other "exchange markets" that don't pretend any legitimacy, $11.14 USD indicates that the PLEX was not purchased in bulk during a sale. After looking at the list of authorized PLEX resellers, even taking into account currency fluctuations, I don't see how anyone could sell a PLEX under $16 USD and make money. The second is the offer of insurance. I know many will say that a site like Kinguin or G2A offering insurance to make sure the sale goes through is a normal business practice. But really, the insurance on the PLEX offered above is 10%. That seems awfully sketchy to me. Of course, the final item on the list screams RMT. The title of the offer includes the phrase "In-Game Delivery". The transaction as described fits the description of real money trading. The buyer is purchasing an in-game item (PLEX) for real world cash. Clicking on the Activation Details link explains brings the following pop-up. So what is the "Donate to" delivery method? The Donate Game Time feature takes a PLEX from Player A's account and gifts it as 30 days of game time to Player B. Not as PLEX which a player can then sell for ISK, but as actual game time. The seller has to take a PLEX from his in-game inventory in order to do the transfer. An in-game item in exchange for real money. A EULA-violating RMT transaction confirmed. So I found a seller engaged in RMT. Now for a little fact I find hilarious. 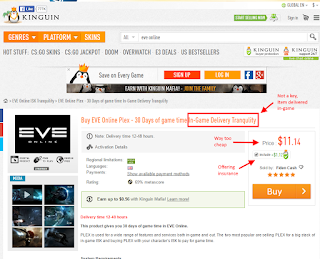 Apart from the RMT offer, buying from Kinguin is more expensive than buying from an authorized PLEX reseller. Here are some examples. First, purchasing two PLEX from CCP or an authorized reseller normally costs $34.99 USD. Here is a screenshot of the offers available from Kinguin. That's right, the offers range from $36.98 to $37.91 per 2 PLEX, or $2-$3 USD more than buying from a safe, approved source. And buying in bulk doesn't improve matters. The approved price for a 6-pack of PLEX from CCP is $104.97. The price on Kinguin? $108.85, or $3.88 more. I found the single PLEX offers were more expensive also. Truthfully, I don't know why anyone would take a risk going to these shady marketplace sites. Anyone going to Kinguin for EVE-related items is sheer lunacy. Except for the instance of buying game time which involved real money trading, the deals are better going to an authorized PLEX reseller. 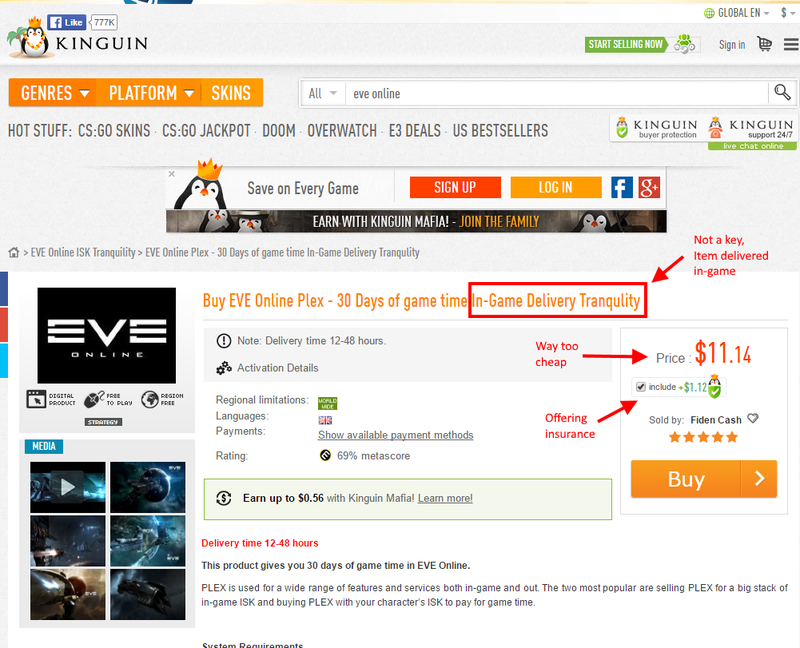 I guess that may make Kinguin more honest than G2A, but I still recommend buying from CCP approved sources. Why take a chance, especially when buying from Kinguin costs more money? Sometimes I get what, at first glance, is a simple story. StupidGenius from the Cap Stable podcast let me know about a story claiming that G2A was selling game keys obtained through credit card fraud. Again. I'm not sure what Virge Salvador Sarpati ever did to CCP Delegate Zero, CCP Falcon, and CCP Affinity, but they love kicking him while he's down. For those who don't know, "King Serpent", as his sister calls him, is the leader of the Serpentis. To say he is having a bad year is an understatement. First, Serpentis lost control of Outer Ring Excavations in November last year (YC117) in a hostile takeover conducted by the newly formed Upwell Consortium. Nothing says hostile takeover better than several task forces of Mordu's Legion striking simultaneously across space. 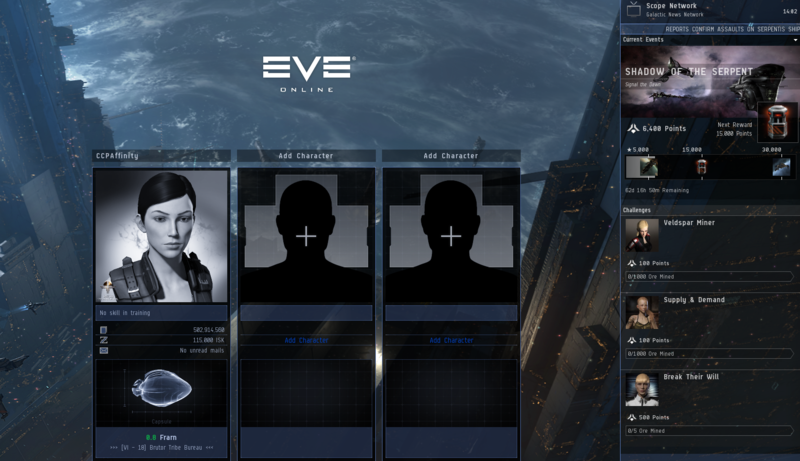 In EVE Online, players will take years to gain their revenge. So will NPCs. The chairman of Upwell's board of directors is Yani Sar Arteu, the founder of Outer Ring Excavations. Further fighting broke out in December as Serpentis Corporation forces destroyed three heavily armed Ducia Foundry mining convoys in Outer Ring. 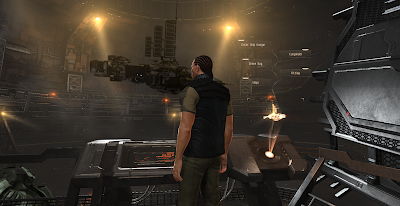 Serpentis continued its efforts against the Upwell Consortium in combination with the capsuleer alliance Omega Security Syndicate in January of this year (YC118), destroying five construction sites building prototypes of the Astrahus-class citadel. Players became involved in the story as part of CCP's first in-game Christmas/New Year event, Operation Frostline. Mordu's Legion decided to publish the locations of Serpentis sites so capsuleers could kill all the things and get phat loot. Among the initial loot advertised was, "apparel, synth-grade boosters, ship blueprints, all manner of high and low value modules, implants and Nexus Chips," with new items added to the loot tables over time. A fun time was had by all, as long as you weren't Serpentis. "The Shadow of the Serpent earns its name from the hidden Serpentis arms race we will see happening over the next few weeks. Naturally, many organizations within New Eden are pretty unhappy with the Serpentis creating new, advanced tech with an intention to distribute and will do anything to put a stop to this and they want your help! "With so much happening in New Eden lately, the major corporations and factions are overwhelmed with work and will reach out to the newly independent Scope Network for help. The Scope Network will use this opportunity to start up a new business venture, as a broker service between the major organizations of New Eden and the real powerhouse; the capsuleers! To help the Scope Network succeed in this venture, we have been working on a prototype framework for a new way to display events happening in-game. "When an event is happening, you will be able to see event specific challenges in your character selection screen. These will also appear in the new Scope Network window in-game, which you can access via the Neocom. Over the course of the event, which will run for 6 weeks, you will notice a much wider variety of available challenges including roaming Serpentis and Angel Cartel pirates and 9 new event themed sites complete with loot and bounties. On top of that, each time you complete a challenge listed on your Scope Network window you will earn points towards small, medium and large Scope Network prize containers. These containers will contain some very nice rewards, a selection of which will be available for the first time during Shadow of the Serpent." I know a lot of traditionalists will hate the idea of putting a to-do list on the login page. The usual suspects will proclaim the end of the sandbox and decry CCP's efforts to turn EVE into World of Warcraft. Those critics have a point. When looking at the mockup of the login screen, I can see echoes of Guild Wars 2 and its daily, weekly, and monthly objective system. Personally though, I ignored that when I played GW2. A mockup of the character select screen for the event. But, is the system good for EVE Online? I do see some advantages. The first is visibility. I am one of those people who is not thrilled about special events. I might participate if I stumble upon one, but unless a game plants the information right in front of me, I will not take the effort to look up the information on how to take part. Making the event more visible will get more people, possibly even myself, to participate. Of course, that will make the drops less valuable, but that's the free market for you. Perhaps the biggest advantage is the synergy with the opportunity system. Right now, the system is very bare bones. If a player logs into the game and kills a rat, the reward is 10,000 skill points. Sure, a player is incentivised to log in for a couple of minutes. But I experienced that in Neverwinter. Do something that takes 15 seconds a day and after awhile I levelled up. Part of the reason that I stopped playing Neverwinter is the ease I could level up. A very unsatisfying activity. Now, combine the opportunity system with the live events and perhaps CCP has something substantive. The player is lured to log into the game by the promise of skill points and then sees the latest activities available for even more rewards. The tasks players can participate in are still unknown, but they could give someone an incentive to jump into the game for 15-20 minutes. I'd call that a win for CCP. "In recent months the CONCORD Inner Circle has started seriously considering a new approach to the issue of New Eden's illicit booster trade. Prohibition was successful in reducing booster addiction rates, but has had serious downsides across the cluster. "The illegal booster trade has enriched the great pirate factions (especially the Serpentis Corporation and their Angel Cartel partners), and led to an increase in underworld violence as local pirate bands compete for slices of this lucrative pie. "Escalating enforcement requirements have stretched the resources of the DED and the empire customs authorities to their breaking points. "In response to these issues, the Inner Circle is planning a complete shift in their approach to boosters. Booster possession, trade and consumption by capsuleers will be legalized, and licenses for legal booster production will be available to certain non-capsuleer corporations (X-Sense being the first authorized manufacturer). Booster production and research by pirate corporations and unlicensed capsuleers will continue to be illegal. "Some CONCORD resources will be diverted to harm reduction programs (mainly focused on treating addiction among non-capsuleer populations). "This change in approach is obviously good news for the X-Sense corporation, and experts predict that it will deal a non-trivial blow to the income of the Serpentis Corporation and Angel Cartel. Nobody yet knows how these powerful pirates will respond, but it's a safe assumption that they won't take it lying down." That's right, now high sec residents don't have to worry about transporting combat boosters around. Not only will that affect PvP, but mission running as well. No longer will PvE types limit themselves to the previously legal synthetic boosters; now they can use the good stuff. Production will still take place in low sec, but manufacturers will undoubtedly transport the goods to high sec markets. Over the past 8-9 months CCP created a lot of content for players by setting them upon the luckless Serpentis. In a couple of weeks, we'll get to see what the future may look like concerning PvE in EVE. I'm pretty sure that Sarpati wishes the lore team would pick on someone else.